When it comes to 12 cylinder engines, 600 plus hp, 550 plus ft lbs of torque, and 200mph top speed, you don’t automatically think ‘luxury sedan’. 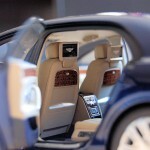 Well these numbers I echo are of the last generation Bentley Flying Spur W12. 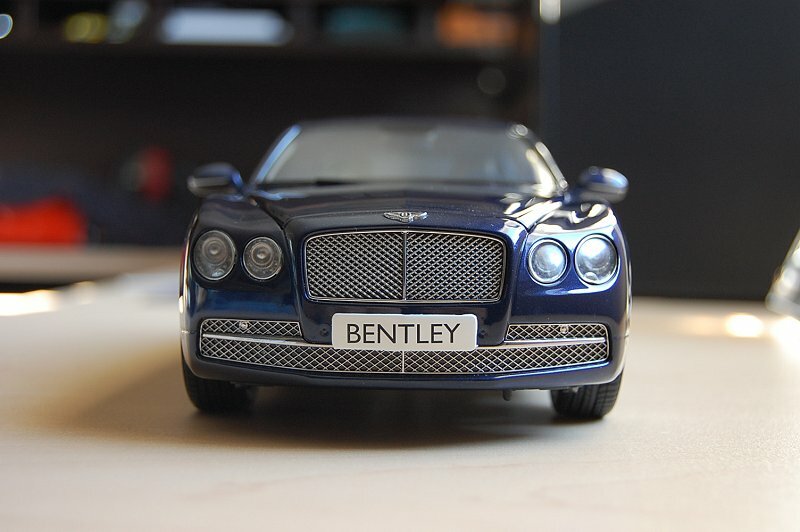 The team at Kyosho announced this model back in December 2013. Two colours would be released – Onyx (Black) and Peacock (Dark Blue), the latter is the model I will present here today. 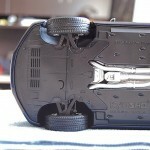 I haven’t been a huge fan of Kyosho lately, read my reviews on their products, and the latest (Lamborghini Jota SVJ) will expose many reasons why. 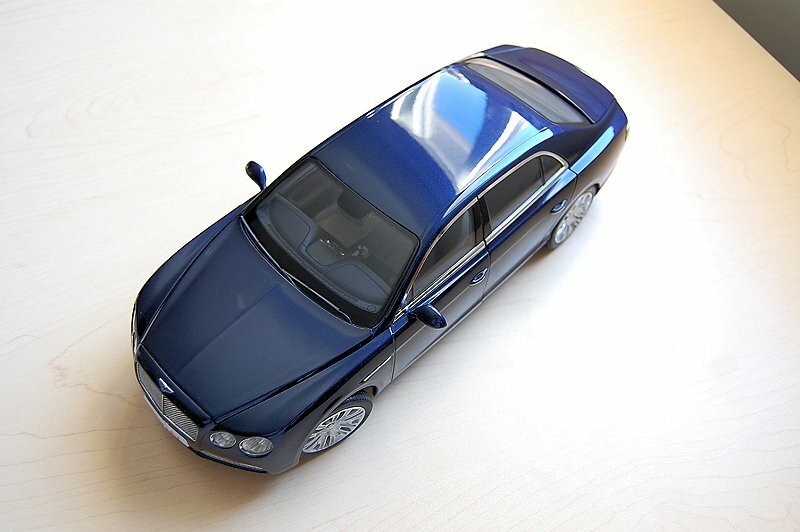 A diecast manufacturer once known as the best mid-range producer of fine diecast models is now a mere shadow of what it once was. 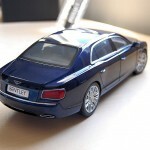 So can they redeem themselves with their latest effort, the 1:18 scale Bentley Flying Spur W12? Let’s find out. Depending on your market, this beauty can set you back way north of $200. Here in Canada, you’re looking at $230-$240 upon purchase. 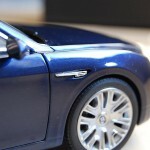 The exterior of the Flying Spur is painted in Peacock, which is better known as Dark Blue to most of us. 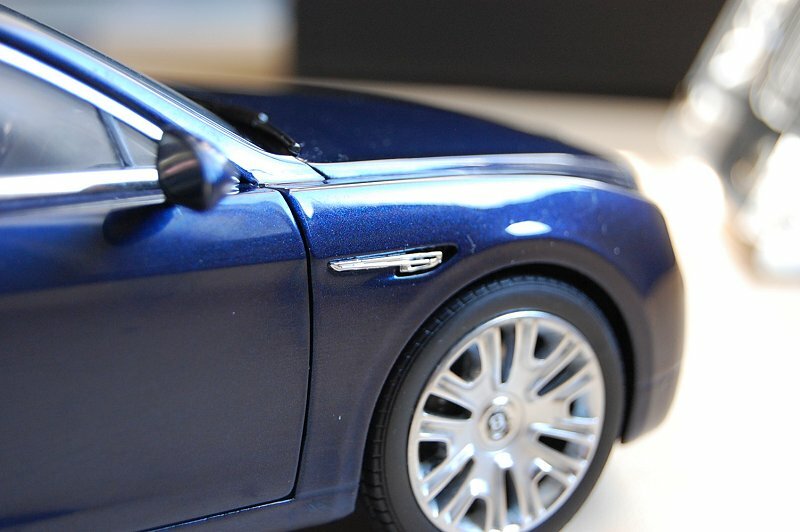 A perfect choice for the Flying Spur’s lines and a unique shade I think. 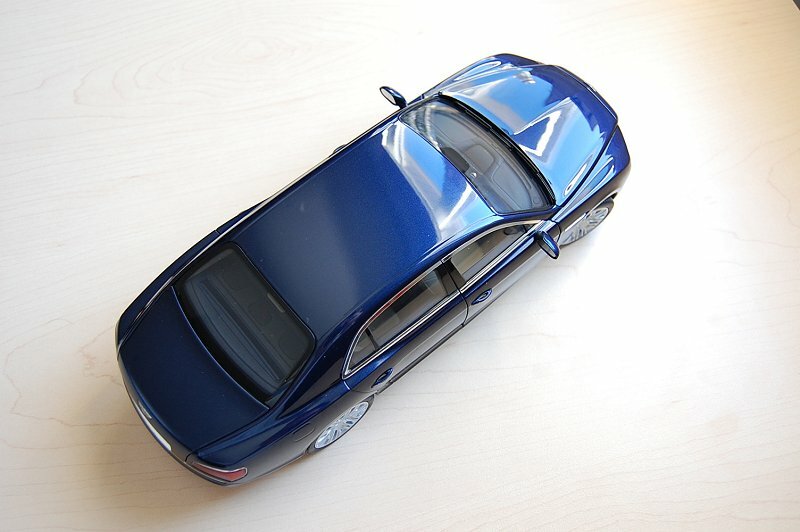 There is a fair amount of chrome work around the model, which is well executed. 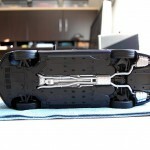 Shutlines and panel gaps are well executed too. I have no issues with my particular model. 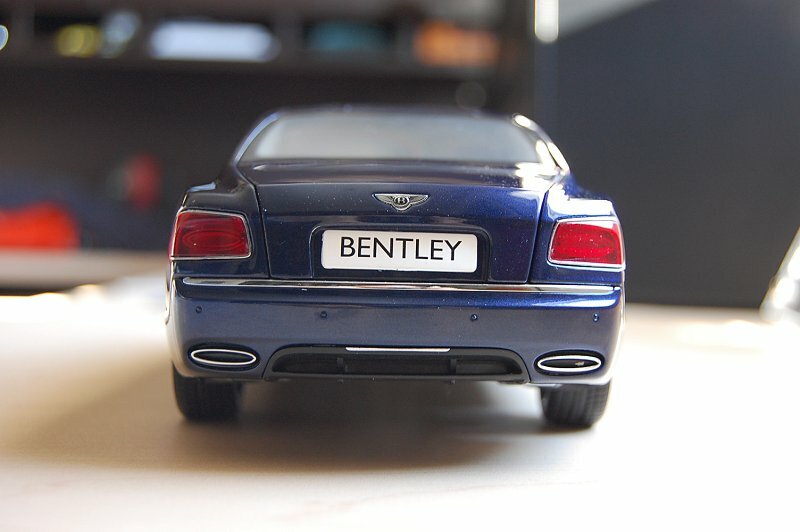 My only gripe with the exterior, based on the price point and “luxury” of the Bentley name, is the poor craftsmanship of the inlet/B-logo on the front fenders. Scale is slightly off and the “B” isn’t as pronounced as it should be. The front fascia is nicely executed based on the massive upper and lower grille work, though a model of this caliber should feature perforated grille work; this model is fitted with solid painted bits. 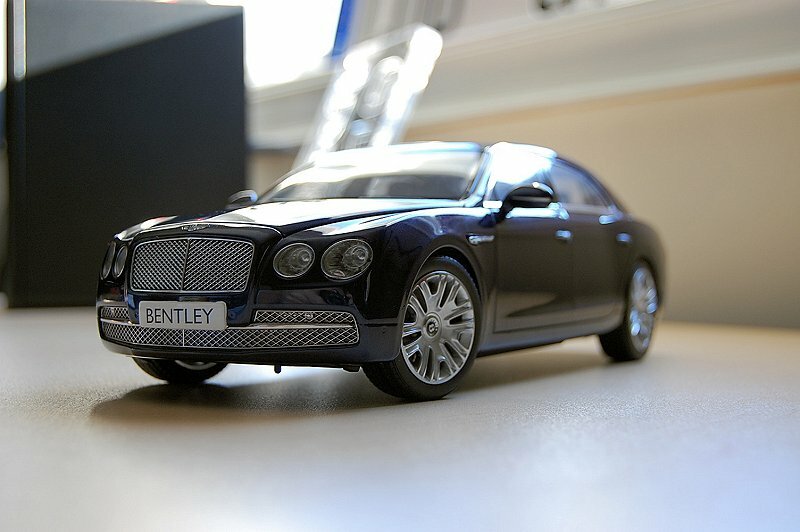 I do like the 3D Bentley badge (front and rear) and above average detailing on the headlights. 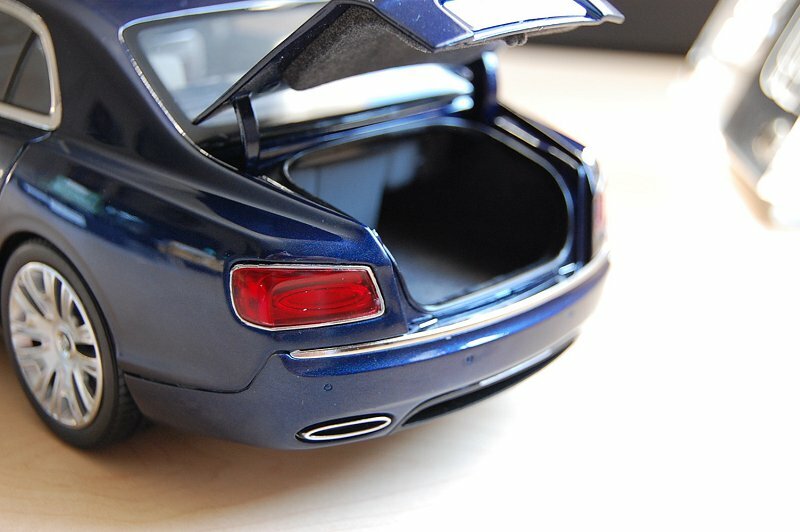 The rear is up to par too, the taillights show depth along with the various chrome bits. 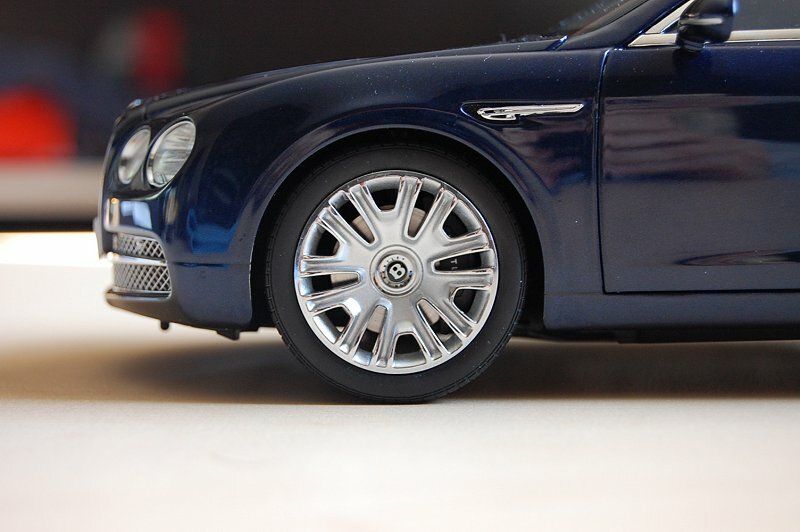 The massive 20″ rollers on the Flying Spur were another wise choice. Though elegant, they also provide a sporty look and feel that, in my opinion, would appeal to a larger audience. Execution front to rear is very good. 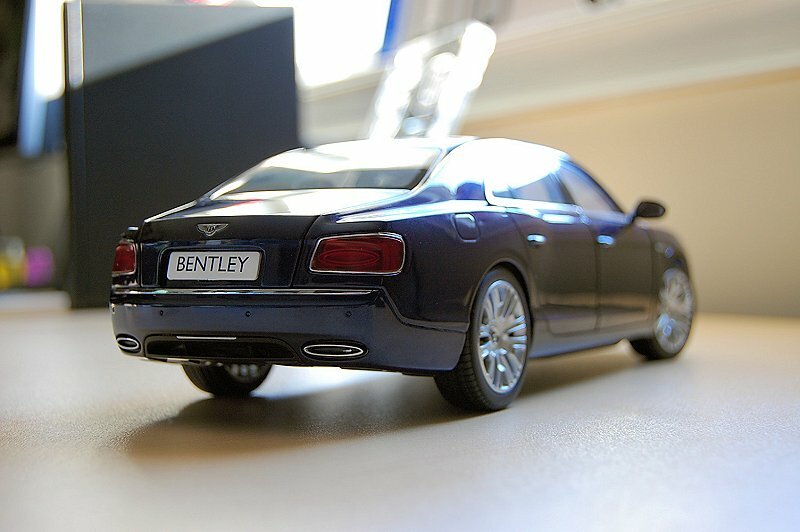 If you look closely behind the front wheels, you will notice the Bentley name across each caliper. Nice touch. 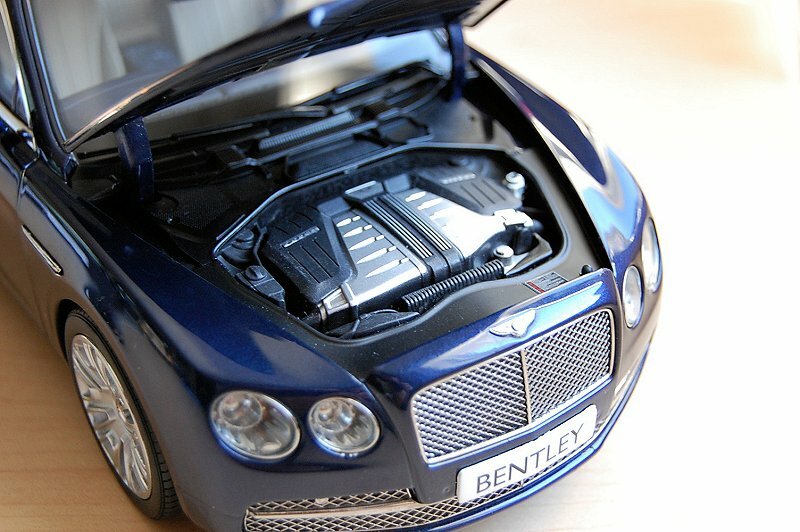 The motor on recent Bentleys has been pretty much monotone – basically much of the motor is covered up, achieving a desired clean look. 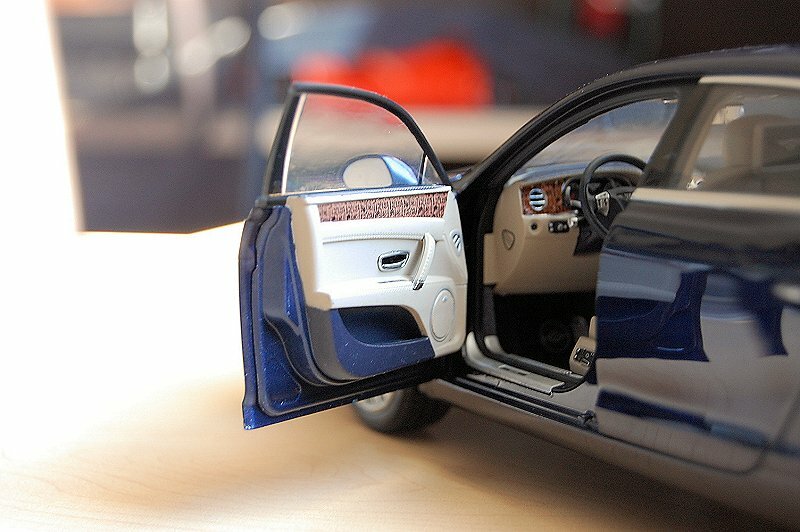 Kyosho definitely captured the essence here. My only complaint would be the lack of updated hinges and struts. Based on a $200 price point I think these items are mandatory today. 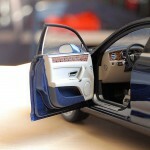 Rear storage is carpeted and very spacious. 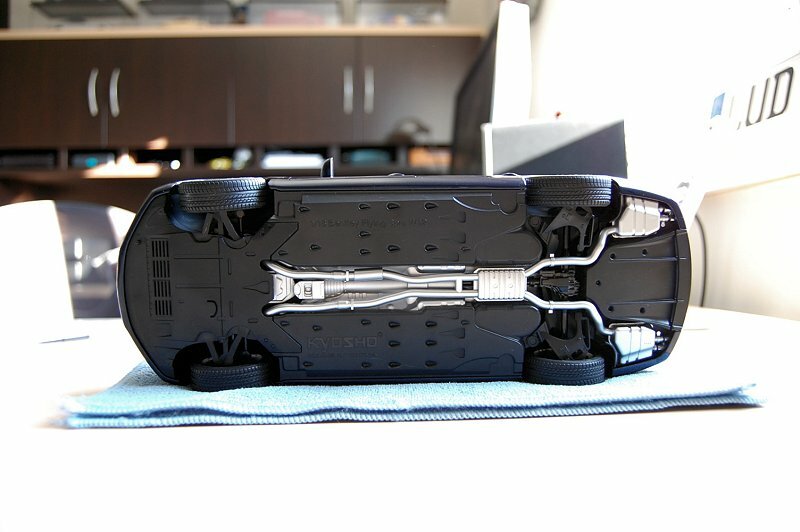 I like the added touch of the carpeted/insulation bit found underneath the hood. 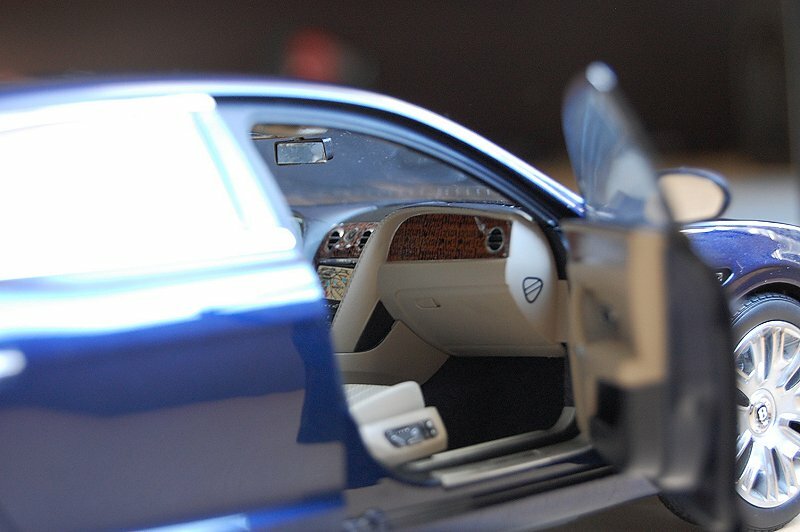 The interior is nicely appointed. 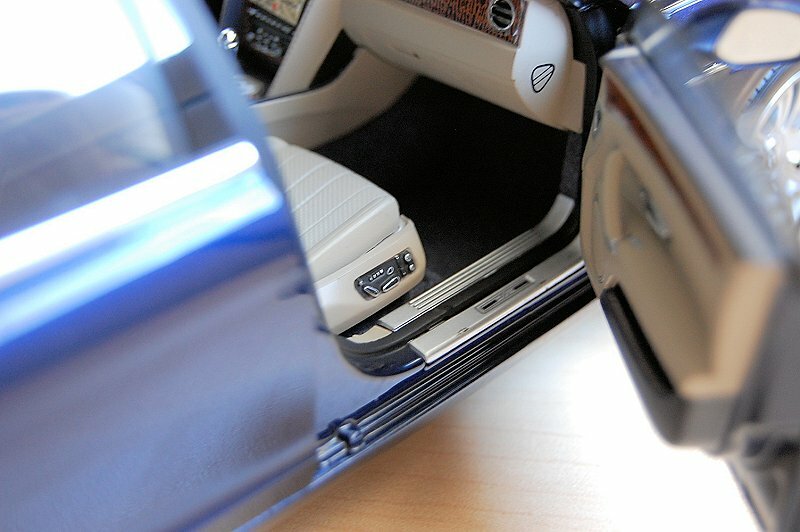 Four functioning doors open to a luxurious two-tone interior – black and tan. 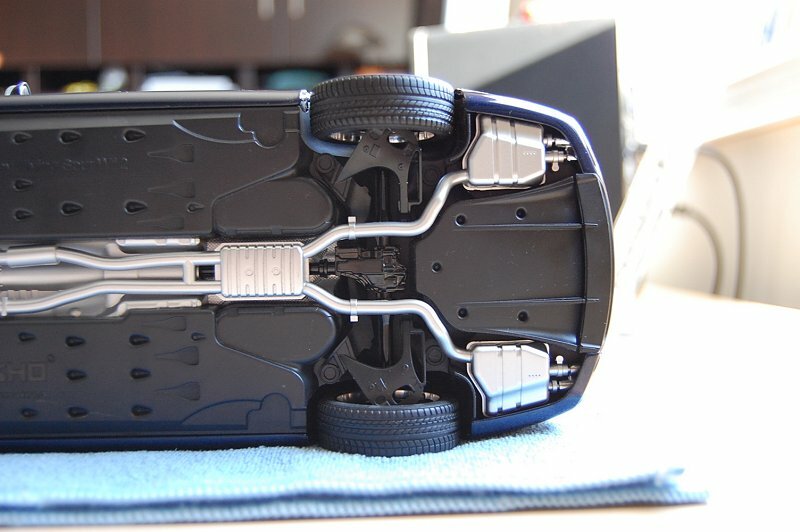 I believe the tan colour should have extended to the middle section of the steering, a miss on Kyosho’s part. The model is fully carpeted as well. 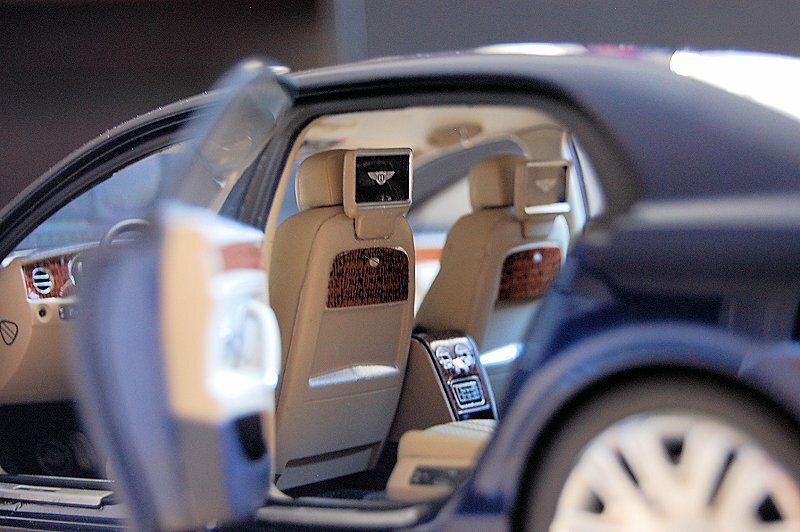 The finer detail Kyosho captured here is the Bentley logo on the headrests, door pillars, rear monitors, and wood grain on the dash, though the depth and overall execution of some pieces left something to be desired. 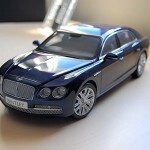 For the most part, Kyosho has done a decent job on the Flying Spur. If they can take most of my points into consideration and make adjustments, they would have a superior product. And based on the $200 price, I don’t think us collectors are asking too much. 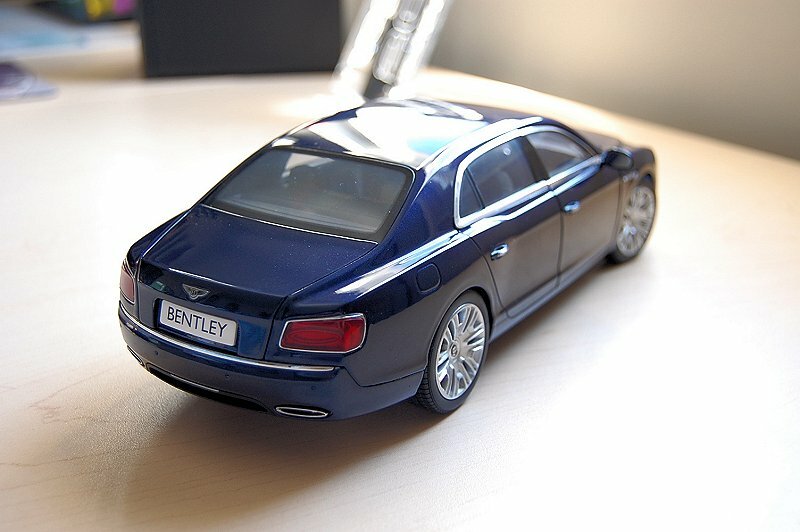 The car fits well along side my other luxury/sport sedans, I’m sure you will find the same. Enjoy the pics! 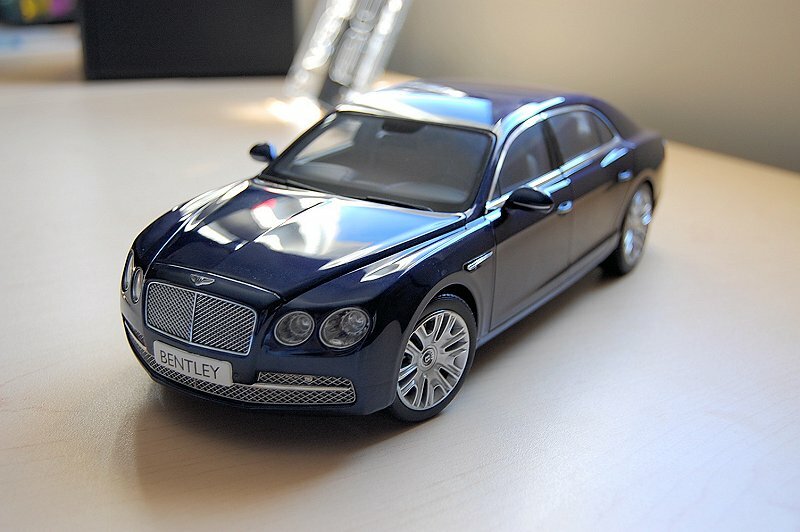 2 Responses to "REVIEW: Kyosho Bentley Flying Spur W12"
Thanks for ur wonderful review. After reading, I bought a piece, peacock, as you said, unique color. Unfortunately, I damaged and cracked the front left door windows. 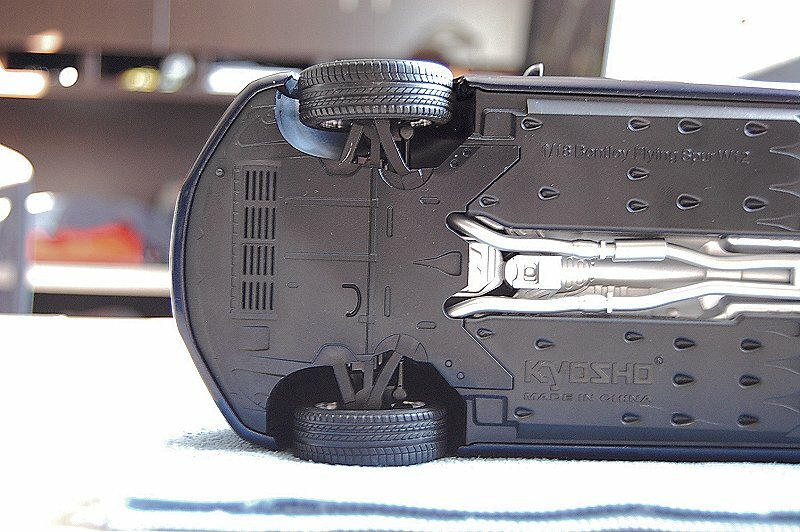 I tried contacting Kyosho but no replies. 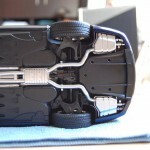 Do you have any contacts in Kyosho or etc who can help? Please? Sorry friend I do not.